A recent lawsuit filed against Stearns Lending and its AMC, Trimavin, by the AMC’s former Chief Appraiser, Katherine A. Scheri, alleges that many of the practices that led to the extensive regulation of the appraisal industry are alive and well at one AMC/lender at least. 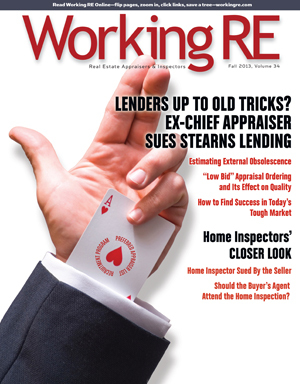 According to the suit, Scheri quickly learned that Stearns Lending had implemented a marketing program aimed at recruiting mortgage brokers and loan officers that promised them that their own personal lists of preferred appraisers would be added to Trimavin’s appraiser panel and would be used on the loans that they submitted. The result, according to the suit, was that private appraiser panels were created for each mortgage broker or loan officer at a given branch. Not long after a meeting was held with upper management from Stearns Lending and Trimavin to discuss Scheri’s concerns. According to the suit, upper management of both Trimavin and Stearns insisted that there is nothing wrong with loan officers providing lists of their preferred appraisers because those names are “blended” with the list of approved appraisers. Scheri responded that such selection is in violation of appraiser independence regulations and Regulation Z of TILA. Additionally, Scheri soon learned that the ranking of appraisers was done in such a way that the “preferred” appraisers were always utilized first, according to the suit. Despite her admonitions, the practice of using loan officer’s preferred appraisers continued. Scheri’s suit alleges that during her tenure, Stearns Lending was conducting a joint venture with builder William Lyon Homes. The Vice President of the joint venture, Jason Forman, formulated a list of “approved” appraisers, according to the suit, and used only this customized list of appraisers on all appraisals performed for loans with William Lyon Homes. 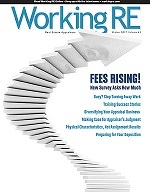 Lately, builders have been particularly vocal when it comes to appraiser issues, with the National Association of Home Builders (NAHB) publishing a white paper which calls for wide-scale appraisal reform because of “extreme bias…imbedded in the home valuation process.” Appraiser Tim Andersen discusses NAHB’s whitepaper in Working RE’s most recent News Edition: Home Builder’s Whitepaper: Appraisers are Idiots. Appraiser Thomas J. Inserra, MBA, MAI, SRA, who served as the National Chief Appraiser for the FDIC/RTC during the 1990s, reports that from what he’s seen across the industry of late there are still many lenders who are breaking the law and conducting business the way they did during the real estate boom. “There are still many hold-outs who continue to believe they can simply waive or ignore rules, laws or procedures that they just don’t like. In fact, some would argue that there is a new wave of ‘dumb’ lenders going back to the old practices,” says Inserra. Scheri’s case, if true, brings the issue of appraiser regulations and independence full circle. Veteran appraisers will remember that HVCC was born out of an investigation into WaMu and eAppraiseIT, by then New York Attorney General Andrew M. Cuomo’s, that eventually wound its way to up to the honchos at Fannie Mae/Freddie Mac, who quicker than you can say “golden parachute,” settled with Cuomo by agreeing to HVCC. As HVCC ended the investigation into Fannie and Freddie, it marked the beginning of the end for many appraisers. This is from a WRE story at the time: “WaMu became unhappy with eAppraiseIT appraisers when they supplied appraisal values that were too low for WaMu to close loans. WaMu’s loan production staff was then allegedly allowed to personally select appraisers who they believed would provide the values WaMu wanted.” Sound familiar? 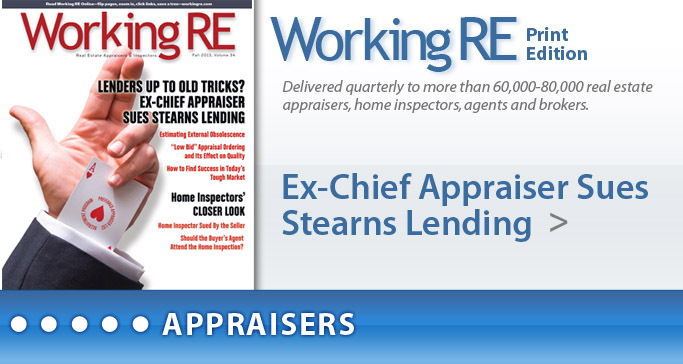 The allegations in Scheri’s suit echo what many appraisers have been saying all along, that the behavior that prompted intense scrutiny and regulation, and the demise of many appraisers, is alive and well. The irony here is that back when mortgage brokers and loan officers could order appraisals directly, I had greater appraiser independence because I had a seemingly unlimited number of clients and no single one controlled a significant portion of my business. If the demands of the client would cause me to violate USPAP, I would simply turn them down and go on to the next order. And if they didn’t like the results of the appraisal, there was no undo pressure to change the report because I had already collected the fee. But really, when I took the time to explain my analysis, 99% of the time I found the clients to be understanding. Disappointed, but understanding. With the AMC’s, I find that they influence value by putting often unrealistic requirements in the appraisal order, and we always have the cloud of being blacklisted and not being paid hanging over us. I find that working with AMC’s results in far less appraiser independence than there used to be, before the HVCC. That Andrew Cuomo guy really messed things up in what appears to be a quest for his political ambitions. All he did was consolidate appraisal ordering into the hands of a few resulting in the driving down fees of fees to appraisers, driving up fees to homeowners, loss of appraiser independence, and expansion of a new and government protected profit center for large institutions. Maybe, when she got hired she was told the company follows the rules, like we all are told publically. She was only there about a year according to the article. I chose to give her the benefit of the doubt as to what happened. If she is telling the truth, she deserves our support don’t you think? She knew exactly what she was getting into — however a Chief Appraiser job seemed to be her goal. I personally dealt with these people — and the lists she speaks about, were not the only lists in her office. She maintained an exclusionary list of appraisers, based on her personal opinion of how she viewed the industry. This lady was noted as standing by every policy Trimavin had for a lengthy period of time, and I have no respect for that. Now she wants the industry to believe she’s a victim, when in fact she helped to victimize many appraisers who wouldnt do as she said. You cant have it both ways. You know the old saying, “You’re not a little bit pregnant — you either are, or you’re not”. She signed on, and stood for everything that’s wrong with this industry. It sounds like she was trying to do what was right, even when it was very unpopular and cost her job. I don’t think it’s fair to criticize her, or even the other people that work there that are just doing what they’re told by people that know better. If more people with some rank had some integrity and tried to do what’s right, we would all be better off. I commend her. Yes, sounds so very familiar. I agree with Lagow’s sentiments above. I am an appraiser. I sued Wamu, First American, Fidelity, and a loan manager at Wamu named Susan Richter in 2008 for a similar 2007 incident. The case was “settled to the mutual satisfaction of the parties” just prior to Wamu’s bankruptcy. I saw some Wamu staff members go on to Chase, while others were laid off. Guess which ones? I saw Kerry Killinger walk away with his bonus. I’ve been interviewed and subpoenaed by everyone under the sun, OTS, FBI, you name it. No criminal charges were every brought against anyone that I’m aware of. As recently as about 2 months ago, I had a process server hand me a subpoena for a deposition for the latest class action against First American. My comment to the Plaintiff’s attorney, “nobody is getting their house or job back now”. I feel for Katherine Scheri. I’m on the OREA website in California if you need to talk to someone for moral support.